Gold and silver rallied strongly last Friday and into Monday's overnight trading (UK time) before spending the rest of the week drifting lower from initial highs to consolidate above notional support at $1200 and $17 respectively. As of first thing this morning, UK time in US dollars gold is now up 2.2% and silver 10.2% on the year. From observing price action, there appears to be continuing underlying physical demand, and on Wednesday the Russian Central Bank confirmed that it had taken the opportunity of sub-$1200 prices to add 300,000 ounces of gold to their official reserves last month. It is also reasonable to suggest that in times of increasing economic and systemic tensions in the Eurozone, some central banks will swap euros for gold to rebalance their reserves. The Fed released April's Open Market Committee minutes on Wednesday, which on balance was little more than another holding operation on interest rates, not bringing them forward to June or putting them off to next year. 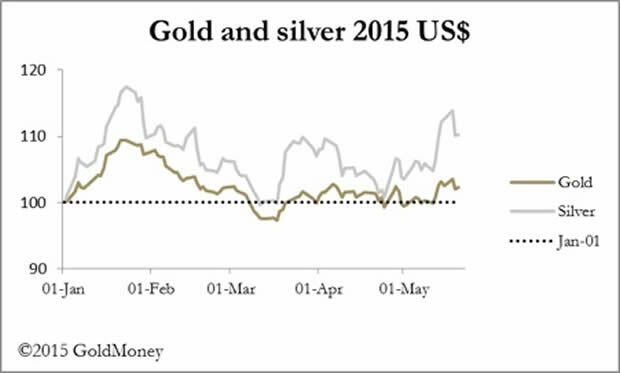 Apart from some minor volatility on their release there has been little effect on precious metal prices. 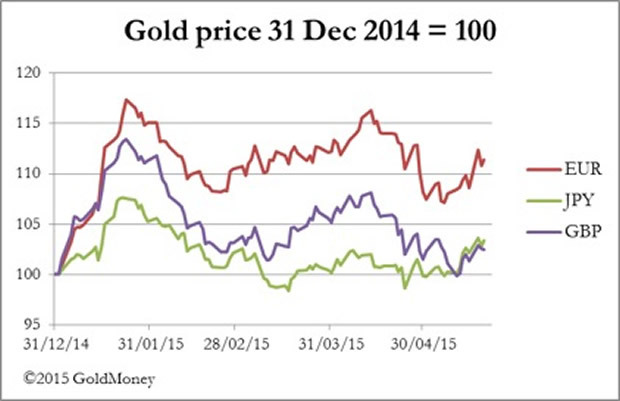 The next chart is of the gold price in the other three major currencies since 31 December 2014. In terms of gold prices, the best performance has been in weakening euros with gold up 11.4% so far this year. The European central Bank announced it would look to accelerate its bond purchases in the short-term, leading currency markets to conclude that economic conditions in the Eurozone are weaker than expected, and with the deteriorating Greek situation euro weakness should come as no surprise. Finally, it is worth drawing attention to developments on the Hong Kong Stock Exchange, where first Hanergy Thin Film fell 47% on Wednesday, wiping $18.6bn off its capitalisation before trading was suspended. This was followed yesterday by a similar collapse in share price for Goldin Financial (Hanergy's broker) and Goldin Properties, together wiping out a further $16.6bn. These events are typical ahead of a speculative blow-off in markets, and while Hong Kong's Hang Seng Index appears to have risen broadly in line with major equity markets, other smaller markets in the region reflect excessive speculation. For example, on the Shenzen Market equities are trading at an average of 67 times earnings, having risen by 12% this week alone, and there are instances of new listings rising more than ten or twenty times in less than a month of trading. Therefore, there is a growing risk that Hong Kong and Chinese equities could become a financially destabilising risk in the region and possibly further afield, adversely affecting other markets and potentially precious metal demand. Monday. Japan: CSPI, BoJ Monthly Report. Tuesday. UK: CBI Distributive Trades. US: Durable Goods, FHFA House Price Index, S&P Case-Shiller Home Price Index, Consumer Confidence, New Home Sales. Wednesday. Japan: Large Retailers Sales, Retail Sales. Thursday. UK: Nationwide House Prices, BBA Mortgage Approvals. Eurozone: Business Climate Index, Consumer Sentiment, Economic Sentiment, Industrial Sentiment. US: Initial Claims, Pending Home Sales. Japan: CPI, Unemployment, Industrial Production.